The upper coastline of the Mexican Gulf forming the southern boundaries of five states—Texas, Louisiana, Alabama, Mississippi and Florida—comprises a diversity of languages, having been at various times a port-of-entry for French, Spanish, German, Irish and Scottish settlers. The verbal landscape surrounding the Italian colony lending Tennessee Williams his setting for The Rose Tattoo encompasses the native parlance of foreign-born immigrants, as well as those of English-speaking citizens whose idiomatic locutions, even over generations, are distinguishable by their origins. The Shattered Globe Theater's cast includes performers with surnames like Niccolai, Colucci and D'Ercoli, but this is no guarantee that they speak—or in some cases, have ever heard—their ancestral tongue. In order to avoid falling prey to stereotypes associated with Yankee notions of "Italian" and "southern" accents, the producers brought in dialect consultant Susan Gosdick to lend an outside ear to actors whose duties include dialogue in both countries' lingua di patria. 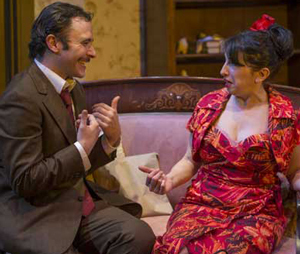 "Italy didn't have an 'official' language—as opposed to its many regional dialects—until well into the 1950s, so this is what Tennessee Williams utilized when he wrote the play," explains Gosdick, "Nic Grelli, who plays Alvaro, speaks fluent Italian, but we were lucky to have Antonella Bonfiglio from the school at Chicago's Italian Cultural Institute provide us with proper pronunciation. She was born and raised in Sicily, so she helped us to hear the open vowels and lilting speech of that district, besides supplying valuable input on the culture." The results of this research, coupled with extensive practice, ensure that the play's heroine, Serafina, speaks in a manner reflecting her assimilation after living in the United States with her husband before his death three years earlier. This contrasts with the halting English of the more recently-arrived Alvaro, but most vividly with her daughter's bilingualism. "Rosa has lived her entire life within the Italian community, but she attends the local school," Gosdick reminds us, "so when she speaks Italian, it's like her mother's, but her English is that of her American acquaintances." "The challenge with any role involving dialects," insists Gosdick, "is not just phonetic replication, but an authentic sound—which is still only one of many tools used to create three-dimensional characters that bring us into the world of the play." The Rose Tattoo runs at Theater Wit through February 28.